The object of the game is to get a score of 9 or closest to it. 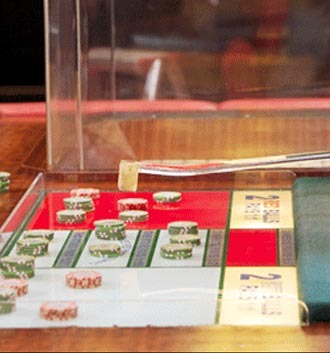 Players may play with the Bank, or against it (as Player), and/or place Tie bets at anytime. Ace counts as 1 while picture cards and tens as zero. Cards from 2 to 9 follow their face value. Each hand’s final score is evaluated as the sum of the cards’ point values less all multiples of ten. The hand that scores closer to 9 wins. The Player is paid even money and the Bank is paid 0.95 to 1. Tie occurs when the final count for both Player and Banker is equal. Winning Tie bets are paid 8 to 1. In case of a Tie, original bets on Bank and Player maybe increased, reduced or widrawn for succeeding play. Player or Bank Pair is an additional betting proposition which wins when either the Player or Bank is dealt with a pair for its first two cards. Winning pair bets are paid 11 to 1.